The version of the Roman Rite used in southern and central England before the Reformation, the 'Sarum (ie Salisbury) Use' (there was also a 'York Use' and others), was celebrated in the late 1990s in Keble College Chapel by Fr Sean Finnegan, then of the Oxford Oratory, now of the diocese of Arundel and Brighton. 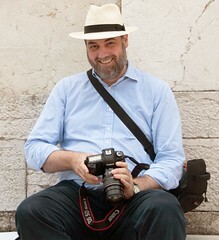 Shawn Tribe has posted some pictures and commentary on his blog; for his full post see here. Here is a picure of the the celebrant saying part of the canon with his arms outstreched, a feature of the Sarum Use which it has in common with the ancient rites of Braga and Milan. 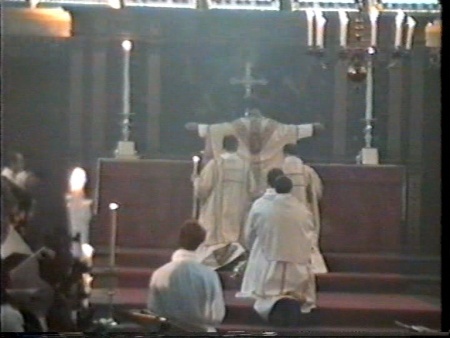 A section of this Mass can be seen as a YouTube video, as can part of an Ambrosian Rite Mass (the ancient Rite proper to the Archdiocese of Milan); see the New Liturgical Movement blog, here. Hat-tip to Shawn Tribe! Fr Julian Large of the Brompton Oratory celebrated the Traditional Mass in the chapel of the Houses of Parliament, in honour of St Edmund Campion, who was tried in the Great Hall next to the chapel. See Joanna Bogle's account on her blog, here. St Edmund Campion had been a fellow of Balliol College and was active in the Oxford area before being captured near Wantage in 1581. He was martyred at Tyburn the same year. 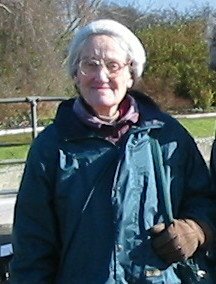 Miss Penelope Renold, one of Oxford’s most redoubtable Traditionalists, a dependable presence in our Masses, tremendously active throughout her long life for the cause of the Traditional Mass, died unexpectedly at home on the 25th June. She was the daughter of Sir Charles and Lady (Margaret) Renold. Her brothers Hans, Peter and Timothy, predeceased her. Penny was received into the Church in 1936, having come into contact with Catholicism while at school in France. After touring Central Europe by Harley Davidson motorcycle, when the War came she served in the WAAF. After the War she completed a History degree at UCL, and began to write books for the Catholic Records Society. Like many Catholics, Penny found the liturgical changes following the Council a shattering experience. At a thinly attended meeting in the House of Commons, called by Catholic laity concerned by the situation, she was inspired by Michael Davies to become involved in the infant movement for the preservation of the Traditional liturgy. She was active in helping priests, preserving discarded books, vestments and sacred vessels, a nd establishing the St Pius V Information Centre, an apostolate she sold in 1978 to what is now the St Paul’s Bookshop in London. As well as devoting her time and energy to this work, she was extraordinarily generous with her money, to a self-sacrificing extent, and her gifts continue to benefit Traditional Catholics all over the country. Since moving to Oxford in 1981, Penny continued to work tirelessly for the Traditional Mass, most recently lending her collection of vestments and church silver for Fr Andrew Southwell’s Oxford Masses, where she was in charge of setting up and putting away the necessary things in our various Mass venues. Not one of nature’s optimists, Penny responded to the tremendous challenges faced by all of her generation with the more practical characteristics of unshakable fidelity to the Church’s Tradition, unlimited energy and organisational ability, and iron determination. 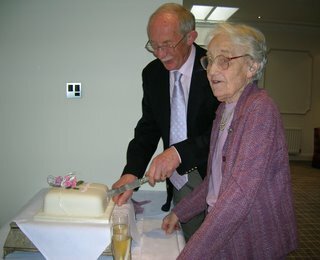 She inspired great affection among the Oxford Traditional community, and it was providential that her splendid 90th Birthday celebration brought many members of her extended family together with her Oxford friends, only a few weeks before her death. Her birthday fell on the feast of St Pius V, which was marked this year by May’s First Friday Mass, sung by Fr John Saward in Penny’s own parish church, SS Gregory and Augustine. It would have given her some satisfaction to have avoided the embarrassment of the short piece of appreciation which had been planned for the August issue of Mass of Ages. She will be greatly missed. May she rest in peace. P.S. There is an interesting article on Penny's remarkable grandfather, Hans Renold, here. See also the report of her funeral, here. The annual Rosary Crusade procession took place last Saturday (14th October) in London. 'Joee Blogs' has posted this video on his blog - thank you! This is a great annual event which attracts many traditionalists. In the light of continuing confusion over the question of the 'other' sacraments, and whether they can be celebrated according to the liturgical books of 1962, here are some relevant documents. For the wording of the motu proprio Ecclesia Dei Adflicta, (July 2nd 1988) see below. It refers to the beneficiaries of its concessions as 'those Catholic faithful who feel attached to some previous liturgical and disciplinary form of the Latin tradition', and 'those attached to the Latin liturgical traditions' - formulations which are clearly not limited to the Mass. This is reflected in the foundation documents of the Traditional orders, starting with the Fraternity of St Peter in the same year (1988), right up to the recent establishment of the Institute of the Good Shepherd (September 2006). In virtue of the faculty granted to it by the Supreme Pontiff John Paul II, the Pontifical Commission Ecclesia Dei concedes to that which is called the "Fraternity of St. Peter", founded July 18, 1988 and declared of "Pontifical Right" by the Holy See, the faculty of celebrating Mass, and carrying out the rites of the sacraments and other sacred acts, as well as fulfilling the Divine Office according to the typical edition of the liturgical books in force in the year 1962; namely the Missal, Ritual, Pontifical, and Roman Breviary. This faculty may be used in their own churches or oratories; otherwise it may only be used with the consent of the Ordinary of the place, except for the celebration of private Masses. Anything to the contrary not withstanding. From the seat of the Pontifical Commission "Ecclesia Dei", on the 10th day of September, 1988. The members of the Priestly Fraternity of St. Peter, as well as other priests who are guests in houses of the Fraternity or who exercise the sacred ministry in their churches, are conceded the use of the liturgical books in force in 1962. Anything to the contrary notwithstanding. Given at Rome, from the seat of the Pontifical Commission Ecclesia Dei, this 18th day of October in the year 1988. III To the Apostolic Administration is given the right to celebrate the Holy Eucharist, the other sacraments, the Liturgy of the Hours, and other rites according to the Roman Ritual and liturgical discipline used from Pope St Pius V, together with the reforms of his Successors up to Bl John XXIII. ...Lastly, to members of this Institute, the Church confers the right of celebrating the sacred litugy, using, and indeed as the rite proper to them, the liturgical books current in 1962, known as the Roman Missal, the Roman Ritual and the Roman Pontifical for conferring orders, and also the right to recite the office according to the breviary as published in the same year. From the seat of the Pontifical Commission "Ecclesia Dei", on the 8th day of September, 2006. Confirmation has been given by Cardinal Hoyos, in correspondance with Archbishop Burke of St Louis, USA. “However, I did have some correspondence with Dario Cardinal Castrillon Hoyos, the president of the Ecclesia Dei Commission, because a question was raised to me regarding the validity of the celebration of the other sacraments other than the Holy Mass according to the rites in force in 1962. Apparently, among some people somewhere, this question arose. They believed there was no permission to do this, and what is more, if a bishop or priest was doing this, that these celebrations were not valid. Now, as a canonist, and being somewhat versed in sacramental theology, I knew that this could not be possible because these rites were celebrated for centuries, and were valid celebrations. It could be that if the Pope had forbidden it, that it wouldn’t be licit. In other words, it wouldn’t be licit to celebrate those rites, but they would certainly be valid. Because this is something that is very important, and something we need to be very clear about, I wrote to Cardinal Castrillon Hoyos. He wrote me back a very encouraging letter, and he assured me that it was indeed the mind of the Holy Father that bishops be generous in permitting the celebration of all the sacraments in the former rites. So that question was answered for me. For the full text of the interview, see here.